You should make the red coulis beforehand so that it can cool down before serving. Put the frozen red fruit in a saucepan and add some sugar and little water. Boil the coulis down to the right consistence. It shouldn’t be thick like preserve. 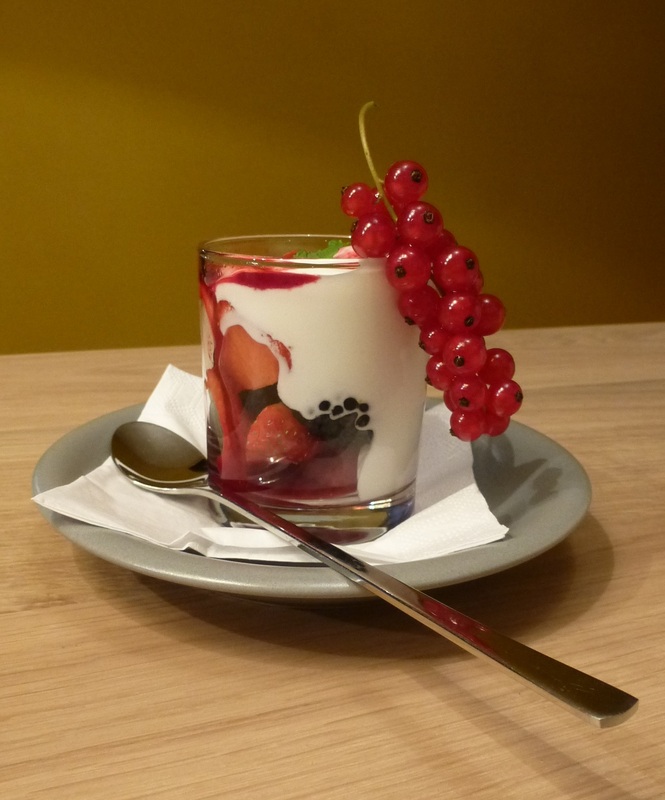 It needs to be somewhat runny to have the nice effect on the yoghurt in the glass. When the red fruit coulis has been boiled down, remove it from the fire and let it cool down. Put the mass through a conical strainer to remove the seeds from the coulis. An alternative would be to mix the coulis with a mixer or a blender. In some recipes they may actually advise you to do both. Poor the coulis in a squeeze bottle and put it in your fridge for later use. When it is time to serve desert, use a nice glass per person. Wash the red fruit and dry it with kitchen paper. Cut up some strawberries and add some to each glass, then add some of the other red fruits and some strawberries again. Continue like this to make the fruit mix until the glass is almost full. Remember to leave some space for the yoghurt at the top. Put some pepper on the red fruit. Now add a couple of spoons of yoghurt on top of the red fruit. Add coulis on top and finish it all off with a mint leaf. Even after a heavy meal, everyone has room for this one. It’s tasty and light, and surprisingly good. Nobody ever refused or skipped our favorite summer desert. If you are not keen on making red coulis, you can replace the red coulis with elderberry syrup. I would then put the syrup on the red fruit first and then add the yoghurt on top to make the desert more surprising. If you make more coulis than you need – which is often the case – you can put it in the freezer and save it next time. I’ve made this desert with plenty of other red fruit like currants, blueberries,… I’ve even used the seeds from a pomegranate. Just use what you have in the fridge. Sometimes I’ve even made alternatives with nectarine, blue prunes and dark cherries. The desert wasn’t as red then, but just as surprising. 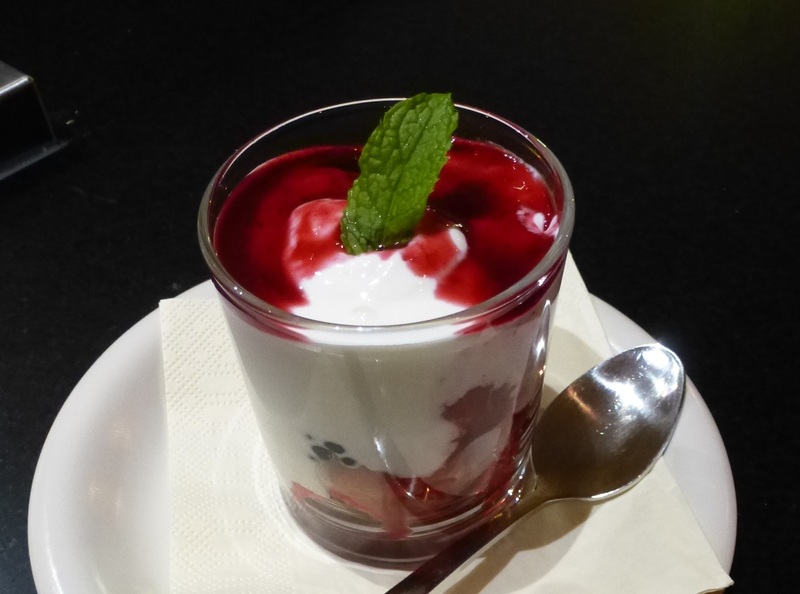 This entry was posted in Deserts and tagged blackberry, cherry, currant, desert, fruit coulis, greek yoghurt, raspberry, red fruit, strawberries, strawberry, yoghurt by petratant. Bookmark the permalink. I discovered the secret of strawberries and greek yoghurt a few months ago, but the coulis, the pepper and the mint are new. Must be delicious. I’ll let you know!